The Campfire Genie is an easy to use BBQ grill and Fire Pit. The grill can be used with wood or charcoal. It's designed to hold logs at the perfect angle to make building your campfire easy and fast starting. The Campfire Genei allows the logs to be elevated off the ground to let a greater amount of air to be pulled into the fire from underneath and accelerate the burn. The Campfire Genie is an easy to use BBQ grill and Fire Pit. The grill can be used with wood or charcoal. It&apos;s designed to hold logs at the perfect angle to make building your campfire easy and fast starting. The Campfire Genei allows the logs to be elevated off the ground to let a greater amount of air to be pulled into the fire from underneath and accelerate the burn. Once the fire has been started let the logs burn down to coals and attach the round grill for the perfect BBQ. When you are done cooking, all you have to do is remove the grill from the fire pit stand and add logs for an evening by the camp fire. Carry all bag holds the stand and removable grill top cooker. Bag has EZ Carry handles that double as attachment points to backpack. The patented firepit stand creates the perfect fire. This unique design lifts the logs off the ground and at the correct angle allowing airflow under the logs for the most efficent camp fire. A removable grill top allows you to BBQ your favorite meals. 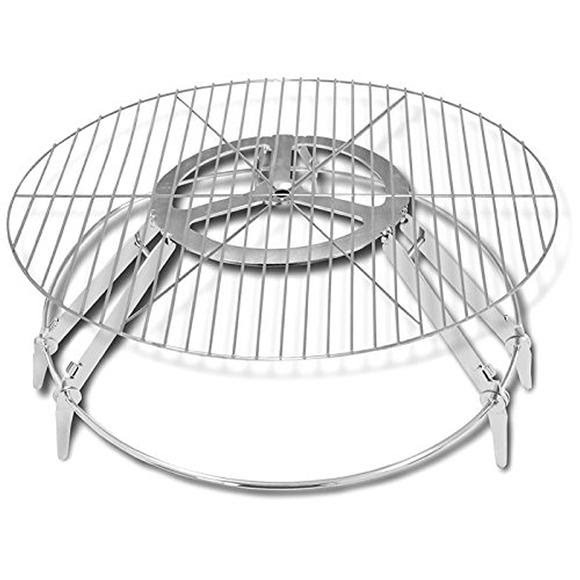 Simply place the grill center post through the fire pit stand center hole receiver, and get ready to grill! Dimensions 22" x 22" x 10.5"